Ethnomedicine is a study or comparison of the traditional medicine based on bioactive compounds in plants  and animals and practiced by various ethnic groups, especially those with little access to western medicines, e.g., indigenous peoples. The word ethnomedicine is sometimes used as a synonym for traditional medicine. 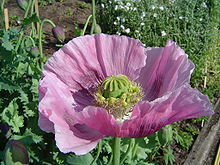 The opium poppy Papaver somniferum, used in traditional medicine for millennia, is the source of the alkaloids morphine and codeine. Ethnopharmacology (occasionally also called ethnopharmacy) is a related study of ethnic groups and their use of drugs . It is distinctly linked to medicinal plant use, ethnobotany, as this is the main delivery of pharmaceuticals. It is the interdisciplinary science that investigates the perception and use of pharmaceuticals within a given human society. Emphasis has long been on traditional medicines, although the approach also has proven useful to the study of modern pharmaceuticals. Ethnopharmacology shares a common terrain with medical anthropology and anthropology of pharmaceuticals. Ethnopharmacology also relates to pharmacoepidemiology, the study of how drugs are used by and affect large numbers of people. Ethnopharmacology is also strongly linked to food science, since dietary modifications are traditionally used as a tool to modify health and disease conditions, and many plant species are traditionally used both as food and for medicinal purposes. ^ Meyer-Rochow, V.B. (January 2017). “Therapeutic arthropods and other, largely terrestrial, folk-medicinally important invertebrates: a comparative survey and review”. Journal of Ethnobiology and Ethnomedicine. 13 (9): 9. doi:10.1186/s13002-017-0136-0. PMC 5296966. PMID 28173820. ^ Thomas M. Johnson; Carolyn F. Sargent (1996). “Ethnopharmacology: The Conjunction of Medical Ethnography and the Biology of Therapeutic Action”. Medical Anthropology: Contemporary Theory and Method. Westport, Connecticut: Praeger Publishers. pp. 132–133, 151. ^ Buer, Jonas Kure (2015). “A history of the term “DMARD““. Inflammopharmacology. 23 (4): 163–171. doi:10.1007/s10787-015-0232-5. PMC 4508364. PMID 26002695. ^ Buer JK (Oct 2014). “Origins and impact of the term ‘NSAID‘“. Inflammopharmacology. 22 (5): 263–7. doi:10.1007/s10787-014-0211-2. hdl:10852/45403. PMID 25064056. ^ Yeung AWK, Heinrich M, Atanasov AG. Ethnopharmacology-A Bibliometric Analysis of a Field of Research Meandering Between Medicine and Food Science? Front Pharmacol. 15 Mar. 2018. 9:215. doi: 10.3389/fphar.2018.00215. Lee, Roberta; Balick, Michael J. (2001). “Ethnomedicine: Ancient Wisdom for Contemporary Healing” (PDF). Alternative Therapies in Health and Medicine. 7 (3): 28–30. PMID 11347282. Retrieved 12 June 2013. Willem, Jean-Pierre (2006). L’Ethnomédecine, une alliance entre science et tradition [Ethnomedicine: An Alliance Between Science and Tradition] (in French). Paris: Jouvence & Biocontact. ISBN 978-2-88353-472-8. Willem, Jean-Pierre (2009). Mémoires d’un médecin aux pieds nus [Memoires of a Barefoot Doctor] (in French). Paris: Éditions Albin Michel. ISBN 978-2-226-18987-5.